Inside Look: A Conversation with APA Student Leaders is a series of conversations with current SRC Executive Committee representatives. The purpose of the series is to spotlight each of the representatives by providing their background, their role(s) in APA, and advice to future committee members. With SRC elections around the corner, the Inside Look series aims to answer the questions that potential SRC Executive Committee representatives may have and create greater awareness about student leadership within APA. George Benson: Hi Anna! How are you doing today? Anna Ma: I'm doing well. Thanks for putting together interviews with the SRC! George: It's my pleasure! Happy to help show the face of the SRC to our members. So, to get the official stuff out of the way. You're the Student Representative Council Executive Committee member for Region IV, right? Anna: Of course! Let's get started. So each representative is elected and I am excited to serve alongside APA National Board as the Midwest region representative including Minnesota, Illinois, Iowa, Wisconsin, Missouri, Ohio, Indiana, and Michigan for a two-year term. George: And you went to the University of Illinois at Urbana-Champaign? Anna: Proud Illini of the Class of 2016. Go Orange and Blue! George: Awesome! Love the school spirit! Now, were you involved in your campus student planning organization before you joined the SRC? Anna: It's crazy to be an alumni already. As an undergraduate, I remember attending career building workshops and sitting on an internship panel. George: Were you part of the leadership of the PSO, then? Anna: I was not at the time. The majority of our board in the PSO were graduate students. However, there was a freshman and sophomore representative position. I didn't discover Urban Planning as a major until my sophomore year. George: Oh, cool! So, you sort of jumped up the ladder a bit by becoming involved with the SRC, huh? Anna: Yea, campaigning was a bit intimidating. I presented a speech at our PSO General Meeting, sent out emails and mentioned it to my coworkers at the Champaign County Regional Planning Commission. George: Knowing the enthusiasm that you bring to the SRC, I can't say this surprises me. Totally to your credit that you wanted the position badly enough to campaign so seriously. It looks like it's paid off. Anna: Phew, it was definitely out of my comfort zone! But once I found urban planning as a profession, I was eager to jump on board and get involved with APA. George: That's awesome! What made you want to join the SRC specifically, especially when all of this was so new? Anna: To be honest, it was when I met Lisandro [Orozco], the past SRC chair, at the 2014 National Planning Conference in Seattle. He was hosting a networking workshop and encouraged me to apply. George: What was his pitch to you like? Anna: I was most motivated by his enthusiasm for this unique leadership opportunity. He said it led him to meet lots of professional planners and work with other students nationally. George: Very cool. And having done it for over a year now, what do you think is the primary value of being involved in the SRC, or in the APA as a whole? 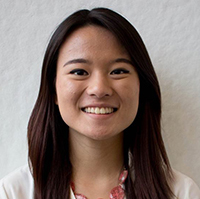 Anna: I'd say my biggest take away is learning about how an organization as large as APA is run through my position as AICP Commission Student Liaison. George: Ohhh, okay. Can you say more about that? Anna: APA puts a lot of effort into creating an organization that adds value to the profession. Which is hard to do because the definition of an urban planner is so broad and diverse. George: Absolutely. And do you feel like you have an eye now on how as big and diverse a profession like this can still stay cohesive? George: So, like many of the SRC, you're now a graduate and have a job in planning, right? Can you tell us more about what you do? Anna: Yes, I'm employed as a full-time planner at the Rockford (Illinois) Metropolitan Agency for Planning. It's a regional transportation agency for federal government. There are 16 for the State of Illinois. George: Can I guess that you studied transportation planning? Anna: No kidding. People will always need to travel. George: So, you moved quickly from graduation right into a job with an MPO. That's very impressive — and very much a theme with SRC members, quick transitions from school to work. Anna: Right, the SRC is a hard working group! And, thankfully, there are a lot of urban planning jobs out there. George: When you look at the planning profession generally, what do you see as some of the big challenges coming up in the future? As a young planner, you have to be gearing up to face things coming down the pipeline, you know? Anna: I definitely see new categories of urban planning come to light. Planning for Smart Cities Initiatives and how we incorporate new technology will change the way planners are able to make more data-informed decision-making for policy initiatives. New projects that are coming down the pipeline include problem solving for planning for safer cities. One project that comes to mind is how do we write city code or policy initiatives for things like smart streetlights? Or, how will automated vehicles that affect safety and transportation? George: Yes, absolutely! There are an incredible number of new issues arising every day. When you think about these, do you notice any differences with how planners our age are handling them than our older colleagues? Do you think the planning profession will look very different 20 years from now? Anna: I think modernization is a hard transition. Especially as young professionals get jobs and work with experts that have been in their field for 10-plus years. George: And what does modernization of planning mean to you? Anna: Working in a public agency, modernization means providing transparency to the public about how the planning process is developed and implemented. George: So, increasing that transparency, helping the public get a better handle on what is going on and better participate in it? Anna: Exactly. In addition, it means creating more transparency between government relationships so that there is more collaboration on urban planning projects. For instance, when municipalities apply for federal funding for enhancement projects including bicycle and pedestrian facilities, why not collaborate on it together so that construction of new sidewalk and bike paths is seamless and connected from one city to the next. George: Sounds like you have some advocacy ahead of you, perhaps. Which actually relates to my next question: How do you see yourself being involved in APA moving forward? Will you run for election in a division or chapter? Anna: Moving forward, I'm excited to stay active with the APA Ambassador's Program. Currently, Rockford Metropolitan Agency for Planning (RMAP), the Rockford Park District, and the City of Loves Park are collaborating as an Ambassador Team to host a few events at the local schools to encourage young students to pursue urban planning as a meaningful career. And I plan on pursuing my AICP certification sometime in the future! George: That's awesome! I know the AICP will be very lucky to have you. I'd like to close out with a fun, final question: What would you tell those who were looking to get involved in the SRC in the future? Anna: Absolutely do it! Traveling with my SRC team has been such a pleasure. It's great to tour new cities and meet other planners who are passionate about the same things I am. George: Awesome! Okay, thanks, Anna! Looking forward to seeing you in person at NPC 2017 in New York City!